In the world of The Haunting Of Hill House, there are certainly ghosts. People in this universe are seeing something real, something that exists outside their minds. Even so, Steven’s not wrong. Too many nights in the months after his death, I “saw” my late partner, drawn and bent from his last illness. There’s nothing supernatural in this; I wasn’t seeing a ghost, and I never believed I was. I was seeing a memory, a figure I’d seen so many times he was etched in my mind’s eye. I was seeing my grief at losing him, my distress at being without him. And I was seeing my temporary, dreadful inability to remember him any other way. I still “see” my late father—in libraries, at bus stops, in the gait of any slender old man with a certain spring in his faltering step. Not everyone sees these things, or thinks they do, but it’s not unusual. That’s not what happening in Hill House. Hill House does something more sinister. Hill House shows a select few of its inhabitants—its victims—something they wish to see, something they fear to see, something they’re destined to see… or to be. And it does more than show things that aren’t (or ouughtn’t be) there. It masks things that are there. It muddies the boundaries of time and space. It makes things spills over from one to another. “A little spill,” Olivia told Nell her “nightmares” were, and so they are, though they were never nightmares. Here gets tricky in this episode. Nell was right here, yelling and waving her arms, and none of her family saw or heard her. It’s a neat twist on a haunting, forcing them and us to wonder what here is, and what when is, when they seem to spill out into other times or places. Another neat trick “Two Storms” plays, one that both destabilizes reality and gives the entire episode a coherent, consistent core, is the repeated use of a circling camera. Its most striking use is during Hugh’s arrival, when it seems like a nimble trick designed for a particular effect, and what an effect it is. When Hugh arrives, shaking off the storm, the camera turns around him as he looks across and sees his children… and so do we. Not the adult siblings knocking back liquor and trading barbs, but the little children he led out of Hill House on that last terrible night. It’s inventive, but simple. It’s affecting and excruciating. It’s more than poignant; it’s a kick to the gut. And it’s completely, utterly earned. It’s a sign that “Two Storms” is going to rise above its predecessors like that spiral staircase rises above the bulk of Hill House. And rise it does. The tension is heavy, but it’s thrilling. Early in “Two Storms,” the previously bloated family drama now feels pointed and precise. And The Haunting Of Hill House delivers one loaded little surprise as Hugh greets his children. “Look at you girls,” he says. What he doesn’t say is that they look so much like their mother, and what he does say comes out haltingly. Except when he speaks to Olivia under his breath. In “The Bent-Neck Lady,” Nell sees her mother beaming at her on the dance floor, Olivia’s hands resting on Hugh’s shoulder. On the unknowing Hugh’s shoulder, I thought then. But I was wrong. Hugh knew. Hugh has carried Olivia with him. And that quiet realization, revealed by a quick mutter, is devastating. Hill House isn’t done with its clever, confident trickery yet. Emotions running high, Hugh excuses himself to the bathroom. But as he turns down the hallway, he walks out of the restrained elegance of Harris Funeral Home and into the shabby grandeur of Hill House. It’s seamless, and Hugh barely looks surprised, even when he sees his younger self running down the grand staircase. It’s a neat trick, and a purely practical one, that destabilizes the reality of this world for the viewer as it was destabilized for Nell, as it must long have been destabilized for Hugh. It’s a little spill from one reality to another. And then “Two Storms” gets bogged down again in family fights. Everything about the blowout the night of Nell’s viewing is realistic, plausible, even probable given their family history. That doesn’t make it interesting, especially when the revelations—Steven’s mad at Hugh for keeping secrets! Shirley’s mad at Steven for making money from their suffering! Kevin’s been taking Steven’s “blood money!”—have been hashed out or broadly hinted at before. This scene uses the circling camera of earlier, but here it just gives us a dizzying look at everyone making frowny-faces and throwing their hands up at everyone else. But. That protracted family fight, and the constantly circling camera, gives us plenty of time to watch the background. It begs us to watch the background. So how did the old buttons appear on Nell’s eyes? 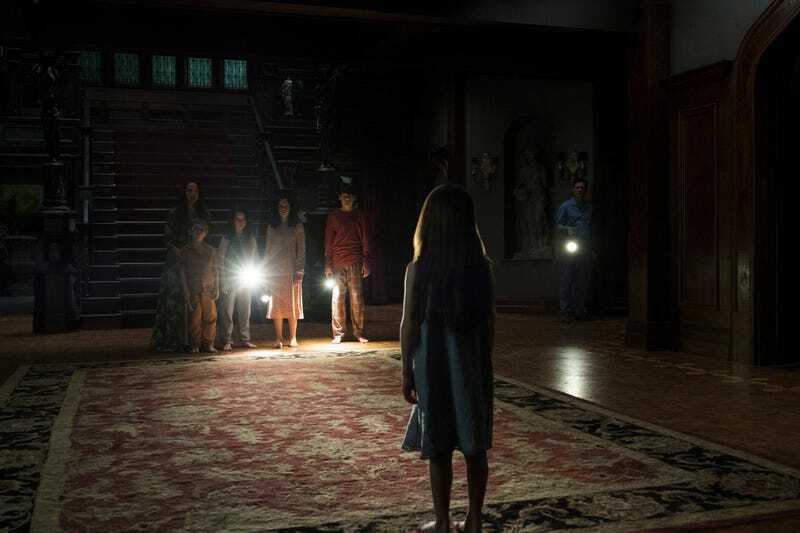 Mike Flanagan talks about the ghosts hidden in plain sight throughout Hill House, some from past adaptations, some cameos from his other works. But even for viewers who aren’t privy to that tidbit, “Two Storms” begs us to search the periphery for something, anything that might be lurking there. 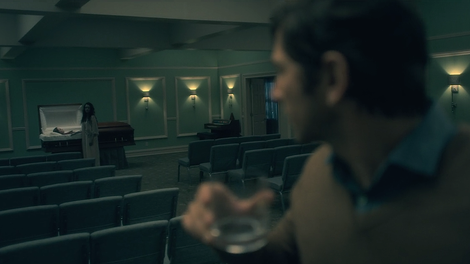 And the one ghost who really matters, The Bent-Neck Lady, Nell—she isn’t hiding at all. She’s standing right here, next to her family. Near her siblings. Next to her own lovingly restored corpse. And no one can see her, except Steven, who can’t admit seeing her, not even to himself. As Hugh Crain, older, beaten by time and sorrow, reunited with his remaining children over his daughter’s casket, Timothy Hutton underplays his pained restraint. Whatever he’s holding back, and however wrong he might be to do it, I believe that he genuinely thinks he’s protecting his children from something worse than not knowing—that he’s accepted their anger and distance and disdain as the cost of keeping them as safe as he can… which is not safe at all. Whatever he’s protecting them from, he believes it’s worse than addiction or night terrors or isolation or rage. The way he walks the halls of Harris Funeral Home makes me wonder how Timothy Hutton would work as Jack Torrance walking the halls of The Overlook Hotel, and makes me eager (and afraid) to see what happens when the family is assembled again in Hill House. This is how a haunted house story should feel. It should feel personal, intimate, eerie, and hellishly engrossing. Watching him, I realized that for the first time, I couldn’t wait to see what was around the corner, both in the hallway and in the series. “If you’re not ready, we’ll go back,” Steven reassures Luke as they approach Nell’s casket, his words barely belied by his gentle but insistent tug on Luke’s arm. “It sounded like a car crash,” Olivia says of the chandelier, and fans of the original will see the allusion there, and in the smashed windows.